Tune in to the White House Maker Faire - Today 10pm EST! President Obama will celebrate innovators, entrepreneurs, and tinkerers of all ages from across the country at the first-ever White House Maker Faire. What do we mean by "Makers," exactly? New technologies such as 3D printers, laser cutters, and easy-to-use design software are enabling more Americans to make and build almost anything these days. Tomorrow's Maker Faire will feature new and innovative projects, inventions, and designs that are sure to amaze -- and some of these projects may very well create industries and jobs of the future. And starting at 10 a.m. ET, you can watch the entire event live at WhiteHouse.gov/Maker-Faire. New Jersey made progress in the rollout of its new teacher evaluation system but it also encountered “significant delays” in developing a sophisticated computer system that will allow teachers to create and share lesson plans, tests and other materials, according to a new report. 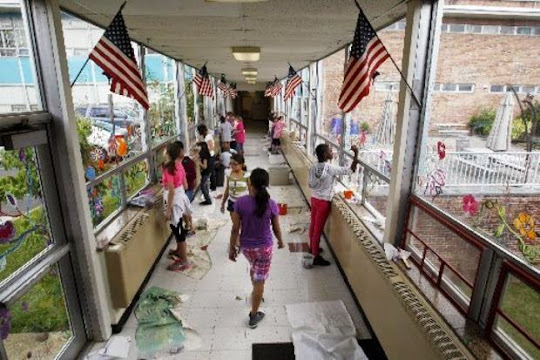 The U.S. Department of Education today released progress reports on New Jersey and the six other states that shared $200 million in Race to The Top federal grants. Awarded in 2011, the grants support statewide reforms and initiatives that promote science, technology, engineering and math, or the STEM subjects. New Jersey did not see any gains in standardized test scores or make significant strides in closing its achievement gap, but it did increase its high school graduation rate, the report notes. The state also sought and received an extension on some its other programs, including changes to curriculum for special needs students and English Language Learners. Race to the Top, President Obama’s signature educational initiative, has awarded $5 billion to 24 four states in three rounds of competitive grants since 2010. The program has also awarded $1 billion to 20 states in Early Learning grants. New Jersey was awarded $44 million for its early learning programs in December. The state's education officials welcomed the overall positive evaluation. "We’re making great strides toward improving education, and we’ve worked to overcome any obstacles that we faced," spokesman Michael Yaple said. "And many parents would find the most important takeaway is the acknowledgment that student achievement in New Jersey has been improving. That’s what matters most." Rowan University graduate students were included in the first Woodrow Wilson New Jersey Teaching Fellows announced by Gov. Chris Christie on Tuesday. The fellowship program recruits recent graduates with strong science, technology, engineering and math (STEM) backgrounds to teach these subjects in high schools that are in need of stronger STEM programs. Each of the seven fellows from Rowan are graduate students in the new master of arts in teaching STEM program at the university's college of education. New Jersey is one of five states participating in the Woodrow Wilson Teaching Fellowships. 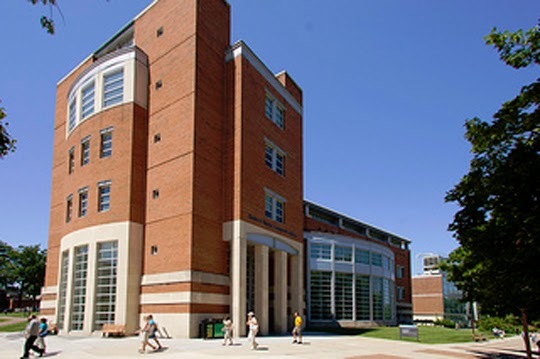 It is funded by a consortium of New Jersey donors, including the Geraldine R. Dodge Foundation, which contributed the initial funding of $10.6 million. "With today's announcement we are reaffirming our commitment to investing in teacher talent with a new pipeline for recruiting highly qualified teaching candidates and training them so that they can generate the greatest positive learning outcomes for our children," Christie said in a written statement. "By preparing these fellows to be top-quality educators, we will be helping more than 15,000 students to contribute and thrive in a knowledge-based, global, digital economy and workforce." Each fellow received $30,000 to complete a specially-designed master's degree program based on year-long classroom experience and in return, must commit to teach for three years in urban and rural New Jersey schools in need of STEM educators. Jeffrey Chiusano of Cherry Hill, a 2014 physics alumnus from the College of New Jersey. He will teach physics at Millville High School. Drew Favat of Gibbsboro, who earned his bachelor's degree from Rowan in mathematics this year. He will teach eighth-grade math at Rossi Intermediate School in Vineland. Bethany Fowler of Uvalde, Texas, who just completed her master's degree in mathematics from Arizona State University and also holds an undergraduate degree in applied mathematics from the University of Texas. She will teach math and engineering at Millville High School. Daniel Klehamer of Avenel, who earned his bachelor's degree in physics from Rowan in May. He will teach physics to juniors and seniors at Vineland High School. Leslie Tolentino of Bronx, NY. A graduate of the University of Albany, she will teach eighth-grade math at Lakeside Middle School in Millville. Christopher Tomlinson, of Chatsworth, graduated in 2010 from Rowan with a bachelor's degree in civil and environmental engineering and earned a master's degree in civil engineering from Virginia Polytechnic Institute and State University in 2012. He will teach math to ninth and tenth graders at Vineland High School. Matthew Zachariades of Egg Harbor Township, who holds a mathematics degree from High Point University. He will teach eight-grade algebra at Lakeside Middle School in Millville. Highly successful afterschool program seeks dedicated and inspired instructors to lead enrichment activities in the All Stars Program at Our Lady of Mt. Carmel School in Asbury Park. Our program is funded in part by a 21st enrichment activities focused around a STEAM theme (Science, Technology, Engineering, Arts, Math) with additional programming in the areas of literacy, physical education, and character development. The ideal candidate has experience teaching elementary and middle school youth or has professional experience combined with a passion for working with children. Content areas include hands-on science, gardening, fitness, kitchen chemistry, culinary arts, journalism, music, architecture, photography, robotics, martial arts, rocketry, Zumba, chess, recycled art, video game design, fashion design, theater, salsa dancing, community service, career exploration, and video arts. Creative class ideas are welcome, particularly those that fall within the STEAM theme. Create lesson plans and lead weekly enrichment activities. Lead hands-on group activities that are engaging and age appropriate. Prepare materials and equipment for afterschool activities. Participate in ongoing professional development throughout the year. A passion and commitment to providing youth with high quality learning experiences. Energetic, with the ability to build meaningful relationships and engage with youth in a professional manner. Experience working with students from culturally diverse backgrounds. A minimum of a Bachelor’s degree or equivalent work experience. Must meet background clearance requirements. Interested applicants should send resume and cover letter to: olmcallstars@gmail.com. STEM is more than a buzzword or a fad. President Obama has built a significant portion of his education policy around increasing interest in science, technology, engineering and mathematics, from hosting White House science fairs to launching a “master teaching corps” of STEM educators. The STEM focus is based, in large part, on an assessment that STEM fields will produce the most high-wage jobs and entrepreneurial innovation in the near and long term. Focusing on STEM is a smart investment based on pretty solid evidence. But at the same time, we may be under-emphasizing the best STEM opportunities out there. According to research from the University of Washington, based on data from the Bureau of Labor Statistics, 71 percent of all future STEM jobs will be “computer occupations.” This chart from the research hits you over the head: It shows that nearly three out of every four jobs we expect to be open in the areas of science, technology, engineering and math will be in technology – in particular, computers. Computer coding, software design, data and system management. The next highest percentage of future STEM jobs is in engineering – at 15 percent. No other single projected STEM-related occupation tops 4 percent. When U.S. News ranked the best jobs of 2014, the first two spots were software developer and computer systems analyst. Web developer was No. 9. Perhaps it’s time we start thinking of future workforce opportunities – and our corresponding investments – in terms of C for computers and then E, M and S for engineering, math and science. “CEMS” isn’t as pretty an acronym, but it’s a lot more accurate. The challenge is that our education system – from primary schools through graduate schools – simply isn’t training people fast enough to fill these computer-related jobs. According to Code.org, in 2013, 14,000 more high school students took the Advanced Placement (AP) exam in Art (44,000) than the exam for computer science (29,555). Five times as many high school students – 151,477 – took the AP Spanish test. And less than 3 percent of college graduates are earning degrees in computer science. It’s not too surprising then that the growing need for employees with computer skills has put pressure on educators and training providers to close the skills gap. I’m partial to one such solution – the coding camp. And not just because I run one. I’m partial to them because coding camps address the problem more quickly and directly than changes to our overall education can or will. To me, coding camps are a fast pass to the STEM job market. And the fact is that this type of skip-ahead option isn’t viable in most other fields – especially the STEM ones. Nobody wants an engineer skipping ahead in school. And unless you’re Doogie Howser, you don’t get to do your undergraduate education and medical school in three years. Of course, no computer coding camp will make you an expert in eight to 10 weeks. The truth is that computer technology is changing so quickly, you’ll never stop learning, whether you invested years earning an advanced degree or months at a coding camp. But the good news is that years of school isn’t the only option. 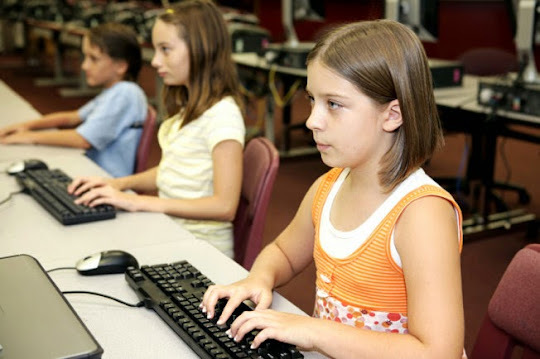 The demand – both now and in the future – is too high for the long lead time it will take to make computer literacy a core component of middle and high school education, although that needs to happen, too. It’s time we start to focus as much on computer education as we have on STEM in general, and include computer education more directly and prominently as we adjust our classrooms to meet our workforce needs. It’s time, also, to welcome computer coding camps as an indispensable part of that conversation. Feeling like integrating STEM into your current curriculum is an unsolvable equation? STEM doesn't have to intimidate or overwhelm you. It's an essential component of every afterschool program, so here are 8 tips to help you start the process. STEM programming does not require STEM experts. Remember, a good facilitator's role is to be a role model for youth and to cultivate curiosity and engagement. Instead of providing expert answers, STEM role models say, "I don't know the answer. How can we find out together?" Science programming does not only mean conducting science labs. Remember, STEM programming can be integrated into many disciplines or approached from many angles. Interpreting observations and using evidence in an argument are great examples of scientific habits of mind that are applicable across many disciplines. Quality homework help, recreation, healthy meals—OST programs have many responsibilities. When is there even time to integrate STEM into program hours? Always! Remember, engineering design challenges or science investigations can provide opportunities to integrate math concepts, as well as practice expository writing when making observations or drawing conclusions. Is STEM programming really aligned with youth development goals? STEM programming is an excellent way to build persistence in youth. Remember, scientists and engineers are constantly revising their ideas or reworking their designs. These STEM professionals are also constantly asking new questions as they make new observations or findings. Okay, but what about 21st century skills, such as communication and collaboration? Remember, scientists and engineers do not work alone; these professionals rely on community analysis and feedback. STEM programming provides opportunities for youth to practice their complex communication and collaboration 21st century skills. Tape, rulers, paper, and other supplies are all over the place. Youth are out of their seats, moving around, and talking loudly with one another. Remember, what looks chaotic, messy, and loud can also be a sign of highly engaged youth working together to solve a problem! The STEM project is completed, now what? Remember, family nights that allow the influential people in a child's life to learn with youth or youth to showcase their hard work are powerful ways to connect families to out-of-school time work. Reimagine a "finished" project as an opportunity for youth to mentor younger grades in a subject area where they are newly confident. STEM programming has real-world applications. Remember, connecting STEM programming to real-life careers helps youth channel their out-of-school interests into future aspirations. Written by Anna Padget Crocker, Project Associate: Afterschool and Community Initiatives at the Franklin Institute Science Museum. This work is part of the STEM 3D: Integrating Science into Afterschool, Home, and Community project which is supported by the National Science Foundation under Grant DRL # 1138911. STEM 3D is an initiative designed to develop strategies and programming models that help afterschool programs integrate science learning and STEM career awareness into multiple contexts of the lives of underserved children and families. Students from Elizabeth Haddon Elementary School came in with a "can do" attitude to participate in the We CAN Help program on May 28. The program challenged students to use the STEM skills they have learned during the year to build structures with canned foods. "This program is great for a few reasons," Denise Sellers of Haddonfield Child Care said. "The kids are able to use the STEM skills they have been learning in a fun way; we get the kids and their parents together to do something fun; and we get to help out the community by giving the canned food away." The students collected the cans during the school year. Cans were also donated by Wegman's Supermarket and the two teams battled it out for those cans in a chess tournament. The cans were put to good use on May 28, when the two teams squared off in a competition to design and build the best structure. The two teams, the Minions versus the Swagin Dawgs, were able to build anything they wanted, so long as they only used the cans they had collected. Parents were also invited to participate in the event and they pitched right in on their hands and knees stacking cans. "The whole concept of this event came together after Torani Syrups began their 'Power Down, Connect Up' initiative," Sellers said. "We wanted to create something that would allow the kids to turn off their screens and be with their families." The We CAN Help program is based on the CANstruction events that have become popular for architecture firms around Philadelphia and New York, in which architects and engineers compete is design competitions with only canned foods. "We took that idea and made it a little more fun," Sellers said. The collection of cans was extensive and after the half hour time limit, both teams had finished constructing their buildings. The Minions designed a castle with a moat surrounding it, while the Swagin Dawgs went in a different direction, building a police station and car. It was then left to the judges, which included architect Jay Reinert, landscape architect Joseph Sikora, Elizabeth Haddon Principal Craig Ogelby and local sculptor John Giannotti. After some intense deliberation, Mayor Jeffrey Kasko announced the winner: the Swagin Dawgs. All was not lost for the Minions though, as they took home the award for most cans collected, brining in 297 cans. "It's always a great thing when you can get kids and parents together having fun," Sellers said. "And it's always nice to be able to give back in the process too." In total, the We CAN Help program collected over 500 canned goods, which were donated to the St. Paul's Church Food Pantry after the competition ended. COOS BAY — A group of Coos Bay fourth-graders are ending the school year on a good note. On Tuesday, Nick Krissie’s class of nine students at Sunset Middle School put the finishing touches on their diddley bows, one-string slide guitars that originated in the South and became a big influence on the blues. When the music class became overcrowded this year, Krissie had an idea. In his spare time, he makes cigar box guitars. The diddley bows are made of very few parts — cookie tins, dominoes, nails and wire — but soon the students were plucking away, trying out that famous riff. The class did the math. After doing just a few chores, they would each be able to afford the materials required to make a diddley bow. 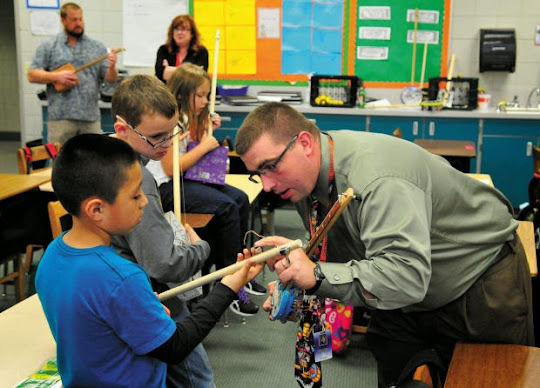 “It’s organized chaos,” Krissie said to superintendent Dawn Granger, with the students scattered behind him, heads bent over their new instruments. The students built everything themselves, besides the holes that Krissie drilled. Principal Dale Inskeep even joined in, wowing the kids with his guitar chops as lead of the Dale Inskeep Band. Fourth-grader Anna Quaglia said the diddley bows took four weeks to make. She plans on practicing over the summer, hoping to add some more songs to her repertoire. This class is a new realm of hands-on learning, incorporating science (sound waves), math (calculating fret positions) and history. Four teams of students from Ringwood's Martin J. Ryerson School recently competed in a Junior Solar Sprints (JSS) competition. In preparation for the race events, the students met afterschool on several occasions to plan, design, and build model cars that run on solar energy. The participants are part of the district's gifted and talented program. The Junior Solar Sprints is a race held annually since 2001 by TransOptions, a transportation-oriented non-profit that seeks to "deliver programs and services that improve mobility, the environment, and overall quality of life in northwestern New Jersey." The program, which correlates with the New Jersey Common Core Curriculum, is offered free to schools with the help of corporate sponsors. It introduces students in grades six through eight to the concept of utilizing alternative energy sources to provide energy options. The cars needed to meet certain race criteria. Students used the engineering design process to design, build, test, and race a working model car. Like real engineers and scientists, they were required to keep a documentation portfolio of their work throughout the project. They were given a minimum number of materials but could also use additional substances if so desired. Of the materials that were supplied, only the motor and solar panel were required as part of the design. All other elements were at the discretion of the teams. 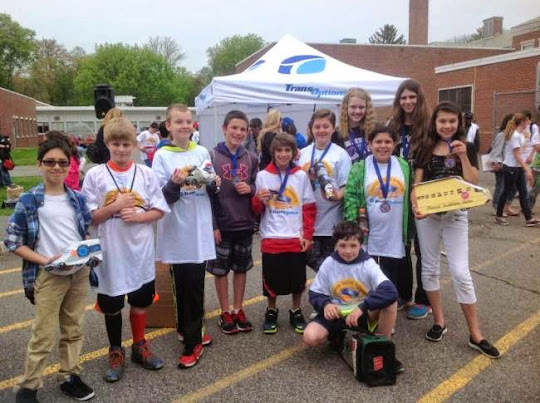 Teams M. E. Kanics, LCHM, Mighty Munchkins, and Lightning built seven working cars and held a local race at the Ryerson School to determine which vehicles would go on to the JSS Division 3 race on May 14 at Ridgedale Middle School in Florham Park. TransOptions holds five division competitions on race week with more than 50 schools participating. After each race, awards are given for speed, craftsmanship, engineering, documentation portfolio, best use of recycled materials, and student choice. Division award winners in every category except student choice qualify to participate in the Inter-County Finals. Three of Ryerson's four teams won awards in the Division 3 competition. Team M. E. Kanics won third place for engineering, team LCHM won third place for best use of recycled materials, and team Mighty Munchkins won first place for best use of recycled materials. Although team Lightning made the top 10 in the speed category out of more than 40 teams, they did not qualify for the next round of the race. The Inter-County Finals were held indoors on May 28 because the weather did not call for sun. More than 50 cars raced and were judged. LCHM, M. E. Kanics, and Mighty Munchkins competed admirably but did not qualify for any awards in speed. However, the Mighty Munchkins again took first place for best use of recycled materials. During the finals, the students found time to start planning their strategies for next year. The JSS competition fosters skills in STEM (Science, Technology, Engineering, and Math) education and gives students an opportunity to be involved in a hands-on project from design to implementation. As individuals, they gain valuable skills in teamwork, design, documentation, and problem solving. Along with alternative energy sources, they also learn about gear ratios, forces, and circuits. TransOptions acknowledged the Alcoa Foundation as the primary sponsor for the JSS competition this year. Other sponsors included Public Service Electric & Gas Co., Thorlabs, Pitsco, FirstEnergy Foundation, and the New Jersey Herald newspaper. 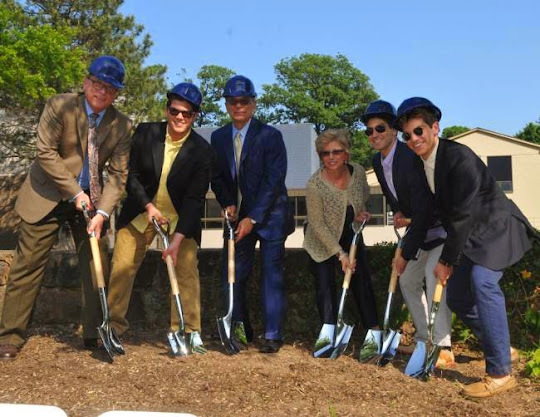 ENGLEWOOD — The Dwight-Englewood School community held a ceremonial groundbreaking Tuesday for a $20-million science, technology, engineering and mathematics (STEM) education building that members hope will better prepare students for the fast-changing world awaiting them. The building, about 30,000 square feet in size, will be called the Hajjar STEM Center. It will be located north of Leggett Hall on the preschool-through-12th-grade school’s East Palisade Avenue campus. School officials expect students will begin attending classes there in the fall of 2015. The majority of the funding for the project — $15 million — will come from donors, according to Liz Tausner, the school’s director of communications and publications. The remainder will come from a $5-million bank loan, she said. The building is being designed with an eye toward fostering collaboration and interaction amongst students and faculty members. Instead of hallways, classrooms will open into a foyer, said Tausner, and students will be encouraged to mingle in the common areas. Physics lab tables will be movable, and the biochemistry labs will be equipped with Harkness tables — large oval tables where students sit with their teachers in an effort to promote learning through open discussion. Furthermore, the commerce department has said that occupations in these fields have been projected to grow by 17 percent between 2008 and 2018, compared to 9.8 percent growth for non-STEM occupations, and STEM workers command higher wages than their non-STEM counterparts. GoldieBlox is a toy company who's goal is to get girls building. They’re here to help level the playing field in every sense of the phrase. By tapping into girls' strong verbal skills, their 'story + construction' set bolsters confidence in spatial skills while giving young inventors the tools they need to build and create amazing things. In a world where men largely outnumber women in science, technology, engineering and math...and girls lose interest in these subjects as early as age 8, GoldieBlox is determined to change the equation. Construction toys develop an early interest in these subjects, but for over a hundred years, they've been considered "boys' toys". 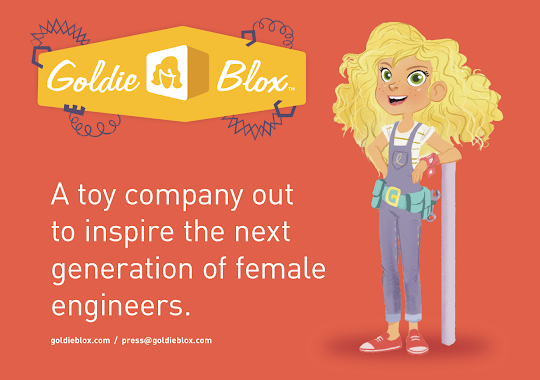 By designing a construction toy from the female perspective, GoldieBlox aims to disrupt the pink aisle and inspire the future generation of female engineers. We believe that there are a million girls out there who are engineers. They just might not know it yet. 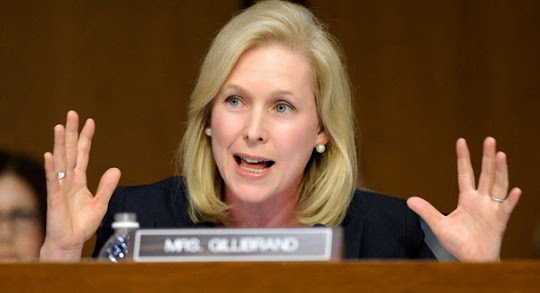 ROCHESTER, N.Y. (AP) - Sen. Kirsten Gillibrand is continuing her push to encourage more young women to pursue careers in science, technology, engineering, and math. Gillibrand says she will outline her plan for so-called STEM jobs Monday at the Rochester STEM High School along with Mayor Lovely Warren and other local officials. The senator says she will push for federal measures to help bring more STEM-related programs. UNION COUNTY, NJ – Registration is still open until June 13 for professional development workshops designed to help afterschool educators and staff bring the award-winning Design It! and Explore It! engineering and science programs for children ages 8-12. The two afterschool programs help students engage with science and technology topics through fun, hands-on projects including gliders, straw rockets, and cake chemistry. 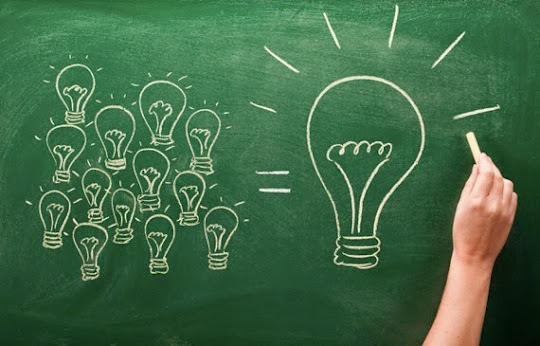 “By bringing relevant learning opportunities like Design It! and Explore It! to Union County, afterschool programs can help prepare our children for the STEM-related careers of the future,” said Freeholder Chairman Christopher Hudak. Design It! and Explore It! were created by Rutgers Cooperative Extension 4-H Youth Development and the New Jersey School-Age Care Coalition (NJSACC), which have also partnered to introduce the two programs to educators throughout New Jersey. In addition to providing the professional development workshops, Rutgers 4-H and the Care Coalition will provide all of the related curricula and materials needed to implement the programs. On-going support and technical assistance are also part of the package. For information about site enrollment and payment for the workshops, contact Mike MacEwan at the Care Coalition, mmacewan@njsacc.org. More details about the Design It! and Explore It! programs are available at: nj4h.rutgers.edu/educators, or contact Chad Ripberger of Rutgers 4-H at ripberger@rce.rutgers.edu. In Union County, the Rutgers Co-operative Extension offers a diverse slate of activities for children and adults supported in part by the Union County Board of Chosen Freeholders, including 4-H Clubs for children in grades 1-12, and the Master Gardener and Master Tree Stewards community service programs. For information visit ucnj.org/rce or call the Extension offices in Westfield, 908-654-9854. Please join the County of Union online at ucnj.org, on Facebook at ucnj.org/facebook, and on Twitter at twitter.com/countyofunionnj.